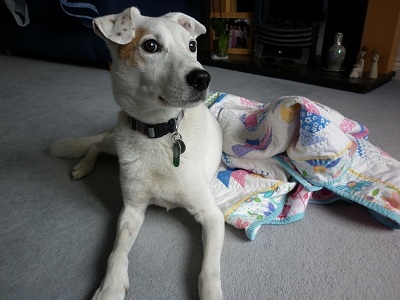 Archie the wonder dog: Biscuit related emergency! Ah, I thought that would get your attention! It's Archie here - I've snuck onto the computer while She Who Controls The Biscuits watches some horses jumping over some funny looking fences. Anywho, BC finally persuaded me that I was going to be allowed on the quilts (albeit for a ridiculously short time) if I would consent to have my photo taken and entered into the competition. Now, BC doesn't usually ask my permission before getting the camera out so I know she must really want me to enter. Question is...what's in it for me? Maybe a nice treat like a jumbone or chew stick? 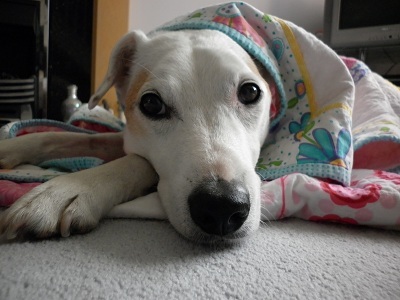 (By the way, have you seen my doggy double on the Dentastix advert? http://www.youtube.com/watch?v=G9HEdK_LChc about ten seconds in, or so I'm told!) Or an extra biscuit a day for the next week? Yes, I think the latter will be perfectly acceptable - I'll let you tell her! And it's definitely OK to be on this quilt? You're sure?! You're not cross because I rucked it up looking for suspicious items biscuits? All this looking handsome is tiring you know...time for a wee rest. I may as well make myself comfortable...still not convinced by the pink though. I was hoping for handsome and dignified but I'll settle for cute. Do you know, I think this may be my best side. Now I look plain daft - I have no idea how I got myself in this position, time for evasive action. Right, that's your lot...I'm having a nap! Right, it's time to go - BC needs reminding that it's almost time for my teatime walk and I don't care if it's tipping down, we're going O-U-T.
Oh, I nearly forgot! I'm going to get BC to reply to your comments - it's nice to keep her involved and give her something to do 'cos she sure as hell isn't sewing. It's been just over a fortnight now, I think she's forgotten how! * The lovely Clare Balding has just said that the horses get to participate in the medal ceremony and get 'decorated' and written into the history books - is that as good as extra biscuits? just got to love Archie! Archie is amazing and has a great sense of humour!!! He looks great with your gorgeous quilts!! I think TWO extra biscuits a day for a month are called for! Modelling takes a lot out of you and you need to keep up your strength- especially when the paparazzi are trying to get your photos and your fans want your pawtograph! Pink does work with your coloring, BTW- and the quilt is beautiful. Great Job! Over in Blogville, we are having our own canine and feline Olympics and you should come on over and Join the UK team! I think Archie may want his own quilt, especialy since he is not supposed to be on the others. I think Archie should definitely get extra biscuits daily for the rest of the year! That's a lot of hard work, modelling like that. BC- wonderful photos! Love them. I just want Archie to train Maddie how to do dignified! She can only do cute at the moment! Hope you get at least one extra biscuit! Loved the show jumping - Go Nick Skelton in the individual competition! Did my own minor efforts on Jack today! Not medal worthy but we are working on it! Genius. That's all I can say Archie. Not only for your typing skills but for your grasp of the English ( or should that be GB???) sense of honour. If only you could master biscuit buying you,d be self sufficient. Clearly Archie I personally cannot type. That should say humour . I feel I should master spell check . Archie, you're hilarious, and you look gorgeous in those photos too! Adorable, I mean, very dignified Archie! I hear some models get paid really well, so that should translate into quite a pile of biscuits for your amazing photoshoot. 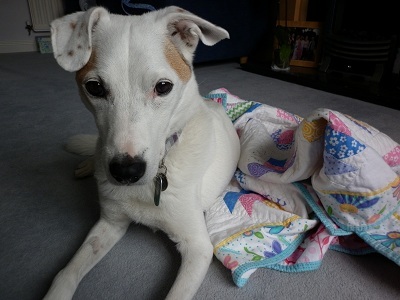 Archie certainly knows how to wear a quilt- He looks quite dashing in it. 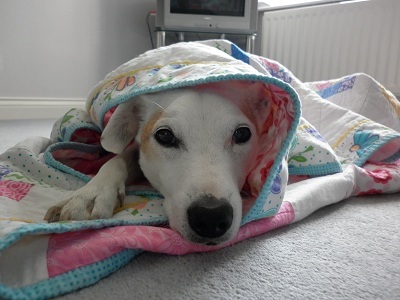 Enjoy the blog hop- there are some wonderful photos of pets on quilts. Archie, you are so gorgeous!! I wish you could come and have a holiday with me as my little boy would absolutely love you! And you should definitely get extra biscuits! Ha ha very funny. Definitely a winner! Archie, what a great post! 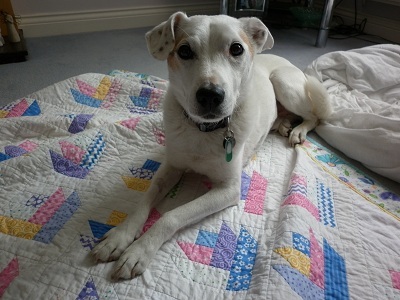 You are a great quilt model and definitely deserve extra biscuits [Note to BC...extra biscuits for Archie, please] for showing off the beautiful quilt. Love you, Archie. You are a doll and seem like a lot of fun to be with. BC, please give Archie a biscuit as he worked ever so hard for them. All that typing! That last pic is a winner Archie, and I do not pay four-legged creatures compliments often, so think yourself lucky! Oh ye who controls the biscuits .... I think Archie deserves at least twenty extra this week! What an adorable, er, I mean, so cute, er, I mean handsome and dignified --- yeah, that's it! LOL Purveyor of Yummy Biscuits, you are hereby summoned to provide extra biscuits for Archie! What a laugh -- so glad you entered the show!! Archie, you are one clever pooch. And stunningly handsome, you make that frilly pink quilt look gooooood. If you could give my Lucy dog some pointers on posing that would be lovely. She's uber cute in person but I just can't get her to cooperate in front of a camera. You, however, are a natural. Archie rules the quilt. I agree blue would show a different side of his character. I think the fee for models is at least an extra biscuit a week for a month. I love that last shot! Archie knows how to get one going! He deserves an extra biscuit or two after all that hard work! Archie may not get as many biscuits as he likes, but he certainly deserves his very own stamp! He's so cute in those pictures! My dog will have none of that "photo-taking nonsense" (her words, not mine) and immediately walks away when the camera comes out. Really lovely pics! Oudone your self this time Archie...funniest post EVER! 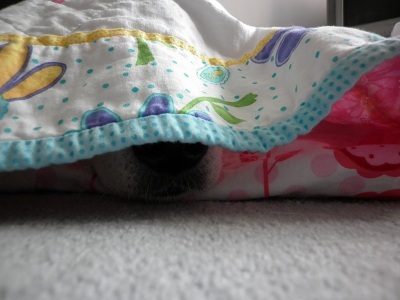 All dogs Down Under have their tails between their legs this Olympics.Its quilts and hot chocolate in the lounge room, either staying up naughty- late, or getting up with the kookaburras to see your "Games". Polo always sits on my quilt AS I SEW. She's taken to a cashmere scarf lately too.....and positively PREENS when the camera comes out. Princess. No biscuits for her or her fat pink fluffy tummy will get fatter! Please tell Helen to find her MOJO and get back sewing. Her creations are always so special. absolutely fabulous post *archie* - great photos and a winner for sure......and even though i'm down under - go team gb!! Archie.....are you single? I know a little cutie pie who wants to know. She thinks you are very handsome. Well Archie....I did a quick paw flick through the lilypad linky thingy ....purring over cat photos and clicked on one desirable purrrfect friend (ever tried internet dating Archie?) ....and guess what... the flikr whatjimmyjig said the photo was snapped in 1980! Now thats ...one - dead - Fluffy. At least you are alive, so I will vote for you come voting time! Mieow....xxxx Polo. Oh Archie...how you made me LAUGH!!!!! I love Clare Balding too. Isn't she just the best! And very kind to animals too. You really do know how to pose to your best advantage. Great pictures!!!! I love watching the horses jumping over those things too, Archie. Our dog has been taking cute lessons from YOU! However, we cats are MUCH pretier on quilts than dogs. Hmph! Archie you are the cleverest dog ever!! 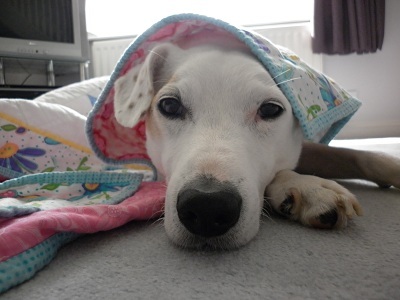 I love the pics with the quilt on your head :) It's a very pretty quilt too! Archie, if there was a Cutest Dog Olympic event, you would win the gold doggy biscuit for sure. Perhaps we should have a chat with Lord Coe? Handsome, cute and you rock that pink Archie, great post. Archie, I think I love you. You come visit anytime, you'd fit right in with our motley crew. Archie, I think that I have just found a new wonder dog. I had a wonder dog when I was a child and have never found another that comes close. You certainly seem to fit! Great post...Archie you are something else. thanks for the giggles. Archie you are so cute! I love the pictures and the quilts aren't bad either! Be sure to tell BC I said that! Archie - you are absolutely fabulous! Love you Archie! There was another entry that could have been your brother-both in looks and attitude....but he appears to be Swedish. Your doppelganger maybe. from USA - Does poor Archie feel left out while you are watching Olympics? We're rooting for the British to win some more medals as well (except for some USA events). Archie is definitely a winner! owww he is cute!! 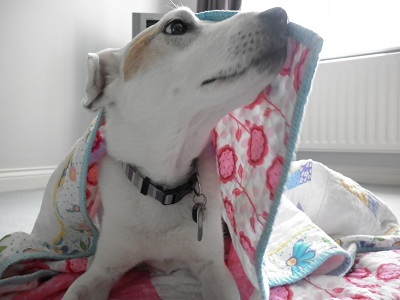 I just love your quilt too, the colours are so soft and pretty! Archie is adorable!! Oh my, looks friendly too!! Just seeing this post. What a great model ! I'm so glad you won, Archie!!!!!!! (Japanese) Prints Charming and a win!